Size: 11" x 8" x 2"
With the Super Speak & line Texas Instruments introduced educational toys similar to the well known kids-computers with there small LCD-screens and ASCII-keyboards. From the technical aspect this Super Speak & Mathl uses a standard voice synthesizer chip (TSP50C10) with an external Speech ROM (TSP60C18) and some external components. The same technology was found in late Super Speak & Spell games. The Super Speak & Math is the successor of the Speak & Math. You'll find more games for younger children in the Computer Fun. The toy is intended for players ages 6 to 12. Everyday Math 6 - 12 years Features Math problems: Making purchases; counting change; percents; and comparison shopping. Math Teasers 6 - 12 years Features Math problems: Probability; sequencing; logical reasoning and more. 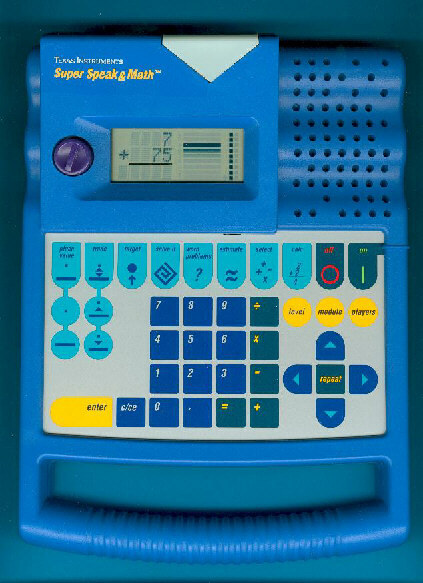 The Super Speak & Math is featured in the Texas Instruments Incorporated leaflet Follow the Learning Path™ dated 1991.